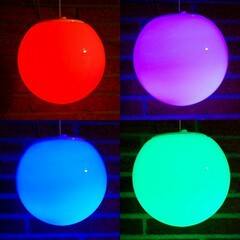 More specifically, each globe contains a Satellite Module and is controlled by a ShiftBar RGB medium-power LED controller. These products were integrated into the final system by Tangible Interaction and intellijel designs. We provided technical consultation, prototyping, and custom design, production and assembly services. This was our first major project collaborating with Alex Beim of Tangible Interaction. A few months earlier we had compared notes on a few projects over Twitter, and he had done some evaluation of ShiftBrite modules. One day, Alex contacted me about possibly using some our ShiftBar modules in a new secret project, only described as a "blockbuster movie" due to absolute secrecy during production. After the project was completed, we discovered that the movie was the latest installment in the extremely popular teen drama series, Twilight Eclipse. We discussed requirements over a few dozen emails. I'm sure anyone involved in application engineering understands how a project like this fragments into many possibilities and finally coalesces into a plan. 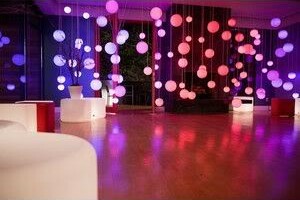 The final verdict was that ShiftBars were the right choice, since he needed to suspend the lighting elements a significant distance. Only four wires would be needed, instead of 12 wires...and the ShiftBars could be placed close together instead of trying to pass logic level signals across 10 foot cables. However, the lighting element needed didn't currently exist. But we did already have a 95% complete Eagle design for such a product, and received assurances from our PCBA supplier that we could make the deadline easily. 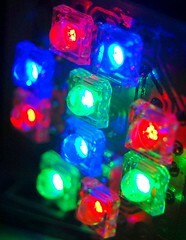 That lighting element was the Satellite Module 001, with four 100mA red LEDs and three each blue and green 100mA LEDs. A major concern was whether the LEDs would appear on movie film correctly. The ShiftBar drivers use PWM to vary the brightness of each LED by turning them on and off in varying proportions. This cycle occurs about 780 times per second, while film cameras capture 24 frames per second. That meant 32.5 PWM cycles per frame...but as any film major would know, it's not that simple. Wikipedia turned out to be an acceptable substitute for a film major, and revealed that motion picture cameras use a rotating disc as the shutter. The disc has movable portions to allow an angular section of the disc to be expanded or narrowed (referred to as setting shutter angle). Varying shutter angles are used for different light and motion enviroments. The main point was that at the widest setting, only 16.25 PWM cycles would be exposed on film, and at a narrow setting only a couple PWM cycles would be exposed. We were worried that there would a visible strobing effect, as seen on TV screens when the camera is not synchronized to the TV scan time. A film test was necessary. Alex was able to mock up a test globe using a lot of ShiftBrites he already had on hand. The camera crew set up a comparable lighting environment, shot the film, developed it, and Alex got the OK to proceed. We immediately completed the PCB design and sent the rush order to our offshore PCBA supplier. In the meantime, we constructed a simple prototype and shipped it to Alex so he could experiment with ShiftBar driving techniques and optimal placement within the globes. Everything seemed to be going well. We kept in contact with our supplier throughout the production and assembly process, and made sure they would be able to ship the module out in time. However, it turned out that they were shipped just one day too late. The package got stuck in Chinese outbound processing right as China was starting an 8-day national holiday. For a few days it looked like everything was normal, but tracking never showed it hitting San Francisco inbound customs. There was still a possibility it would arrive in time, but we had to call Alex and explain that they might be stuck in transit past the deadline. This turned out to be an impossible situation; we were cutting close already, and Alex needed a minimum amount of time to integrate the modules and complete the system tests. Filming would take place in about 7 days! It looked like the project was dead...there didn't seem to be any way to get these LED modules. We scoured suppliers looking for other modules that would work with ShiftBars and found nothing. 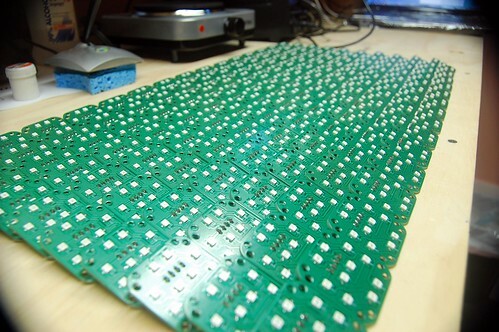 Finally we decided to look into how fast it would be to build a complete new batch of LED modules. The main problem was that the high power LEDs we used are not easily available in the USA. Instead of looking for pin compatible replacements, we hunted for any similar LED. Finally located some 150mA surface mount LEDs at Digikey, in high enough quantity. We still needed a PCB for these, and some way to assemble them. An Oregon based quickturn PCB manufacturer, PCBunlimited, promised that they could get us the PCBs in less than two days if we got the CAD files to them in 45 minutes. 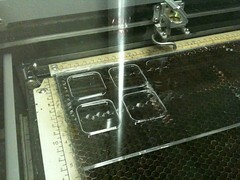 We immediately made an Eagle part for the new LEDs and designed a new PCB, all in about 30 minutes. LEDs and screw terminals were on the way, and everything would arrive ready for assembly two days before our latest possible ship date. The previous LED module order did eventually arrive, one week past the deadline. In the meantime, we set up the assembly line. Hand soldering the LEDs with wire solder would have taken far too long for 150 modules, each with 44 solder joints. The only reasonable assembly method was solder paste stenciling. We already had some 2mil mylar from previous solder stencil projects, so we used the laser cutter at TechShop to cut out a stencil. This would work perfectly with solder paste we available. 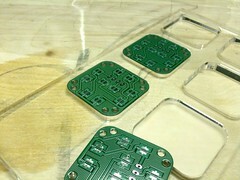 Stencil positioning is the hardest part of solder paste stenciling, so we also made acrylic jigs to hold the PCBs at known locations. This also allowed stenciling six PCBs at a time. 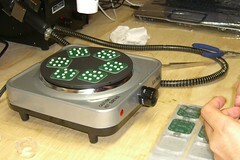 Once the PCBs arrived, we started assembly. I would set up empty PCBs, position the stencil, and apply solder paste. Then Jason would place the LEDs on the solder pads using tweezers. While that was happening, I would solder a previous batch of PCBs. To prevent damage to the delicate plastic LED housings, we used a hot plate to preheat the boards slightly less than solder melt temperature. Then I used a hot air rework tool to gently heat the LEDs until the solder paste flowed. Another method would be to use a toaster oven for reflow, but we wanted more control over the reflow process and didn't want to risk any modules while establishing a reflow profile. Finally we completed the LED soldering and added the screw terminals. Everything was ready just in time...we immediately shipped them to Alex. Of course, building the LED hardware was just one part of the project. 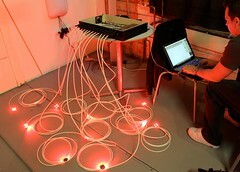 Alex and the rest of the Tangible Interaction crew had built up the rest of the system while waiting for LED modules. They had to make control boxes to hold the ShiftBars, then cut, strip, and install hundreds of wires. This is an example of a ShiftBar + Satellite Module system, with only eight modules. Tangible Interaction needed to integrate over 100 modules in a way that would be reliable, repairable, and easily controlled from a computer using standard protocols. Danjel from intellijel also does a lot of work with Tangible Interaction, and was responsible for the control integration. 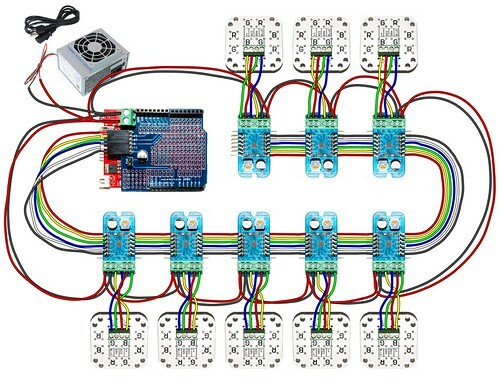 He used a ShiftBrite Shield to prototype a custom DMX compatible Arduino, then developed an Arduino with integrated DMX receive capability (the DMXduino). These short leadtime projects are always plagued by Murphy's Law. Often you become aware of problems from directions never previously considered. It was definitely tough to pull this project off despite the difficulties, but it was also a rush to work with a company like Tangible Interaction and to test our own limits to get the job done. It was also encouraging to see some of our products considered good enough to make it onto the silver screen. Submitted by Paul Grayson (not verified) on Wed, 06/30/2010 - 08:23. Cool! That was an exciting story, and I am glad that you managed to ship the parts out despite the logistical nightmare. I am also curious about why you had to do a PCB redesign in the first place. Did you need a feature not present in the current Satellite Modules? Are the unused modules the reason for the current sale on those modules? Submitted by Garrett on Wed, 06/30/2010 - 13:29. The redesign was necessary because the LEDs we could get on short notice were completely different. The original Satellite modules we ordered were all sold a long time ago, we're a couple batches since then...we're running a little sale right now to do some testing for the correct price point for these since they are going a little slower than we'd like. Submitted by Paul Grayson (not verified) on Fri, 07/02/2010 - 11:15. Oh! Somehow, reading this on Wednesday, I was not getting the crucial point that the Satellites were designed for this movie, and I was wondering why you had to "redesign" the Satellites when they had been out for a long time already. It makes perfect sense now. Submitted by RobotGrrl (not verified) on Thu, 07/01/2010 - 07:01. This is absolutely amazing! Congrats on a job well done! The extra effort to figure out how the PWM would work onscreen is really cool! Submitted by Garrett on Thu, 07/01/2010 - 15:53. Thanks Erin...I confess I did sweat a little wondering if the LED arrays would actually work the same as the ShiftBrite test, and they would have a bunch of worthless footage. We have thought of making globes available but haven't found a reasonably priced source. Submitted by ericwertz (not verified) on Tue, 07/06/2010 - 22:19. When I got to the part about you sending the gerbs offshore with any deadline at all, I knew that Act IV of this play wasn't going to be uneventful. It just almost *never* seems like a good idea just to save a couple hundred bucks. I'm as cheap as the next guy (ok already, cheaper! ), but it's been my experience that the Pacific Ocean is the Bermuda Triangle as far as electronic components (and oscilloscopes) are concerned. Days randomly turn into weeks, and a week into a month. I'd have paid the extra $200 and had the kids in South Park make them, rather than not being able to sleep for two weeks. Nice work, and nice save!